Ariana Huffington’s eponymous clickbait factory is so often a cloaca of journalistic offal that it is almost painful to cite it, but this piece by Joseph Nye is an important exception, if for no other reason than its source. Nye is a calming voice of reason, suggesting that despite China’s frequent and heavily-covered displays of bad-actor behavior, the interests that bind China, Europe, and the U.S. run deep and are often overlooked. His point is well-taken, and generally that approach offers a foundation for diplomacy for both President Obama and his successor. Some analysts see China as a revisionist state eager to overthrow the established international order as its strength increases. But China is not a full-fledged revisionist state like Nazi Germany or the Soviet Union in the last century. While it has joined in the creation of a BRICS development bank, and promotes regional organizations that suit its needs, China has benefited greatly from, and is not eager to destroy, existing international institutions such as the UN, the International Monetary Fund, and the World Trade Organization — as well as many others. American allies help shape the environment that encourages responsible behavior, and China cares about its reputation. China does care about its reputation, but Nye appears to summarily dismiss the possibility that China sees its reputation best served not as a conformist participant in a “Western” new order, but as the power that exploited that order, demonstrated its fundamental weaknesses, and then replaced it with an ostensibly superior international system rooted in Beijing’s own ethos. China, in short, may not appear today to be a “full-fledged” revisionist state like the Third Reich, the USSR, or interbellum Japan. But even Nye must acknowledge that Germany and Japan both appeared to operate as troublesome participants of the post-Versailles system until at least the Marco Polo Bridge incident in 1937 (for Japan) and the Sudetenland crisis in 1938 (for Germany). Revisionist powers do not always start the game (as did the USSR) in open opposition. Some operate within it until they must reveal their true intentions. Nye, for all of his wisdom, is no more privy to the thinking of Beijing’s highest councils than we. 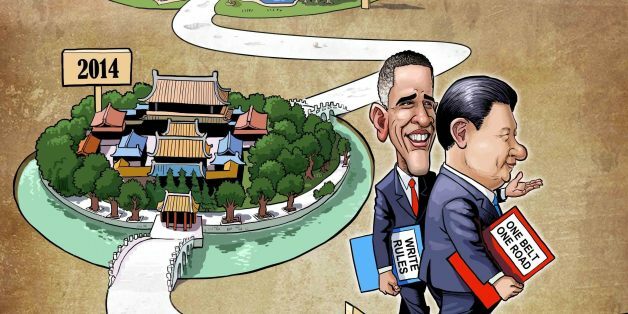 At the same time, a wise and cautious observer will find in the pattern of Beijing’s actions over time evinces a design to displace – if not actually replace – the global international order with one of its own making. At the very least, we must prepare for a future when China finds its participation in the current liberal global system more a hindrance than a help, dividing the world into competing systems if not upending the existing order altogether. The prolific and erudite Andrew Erickson now delves into the most important question surrounding China’s growing naval expeditionary operations: how it is handling logistics. For a military lacking a significant history of operations with globe-spanning supply lines, the speed with which China can learn this craft will do much to determine both the sustainability and effectiveness of deployments abroad. It’s not easy to strike that balance and do so cost-effectively: the recent prosecution of USN Captain Donald Dusek underscores the dangers of running an overseas logistics procurement operation, and shipping supplies from home will be expensive and tricky. Projecting power abroad will, for China’s armed forces, prove itself to be a cluster of unanticipated challenges. As China deploys surface-to-air missile (SAM) launchers to the Woody Islands in the South China Sea, CNAS Defense Strategies and Assessments Program Associate Fellow Kelley Sayler has written a new report, “Red Alert: The Growing Threat to U.S. Aircraft Carriers.” The report examines the short-, medium-, and long-range threats to the carrier – including SAMs and other anti-access/area denial capabilities, in which China is investing heavily – and concludes that U.S. carriers will not be able to act with impunity in the event of future conflict. This new report explains how central government efforts to address excessive production capacity have been ineffectual due to regional protectionism, weak regulatory enforcement, low resource pricing, misdirected investment, inadequate protection of intellectual property rights and an emphasis on market share.